It's difficult to not be immediately intrigued by the dark, foreboding atmosphere of KRUNCH, an indie game by LeGrudge and Rugged that puts a new spin on the familiar twitch platformer genre. In fact, this game of stressful close calls and peril-filled levels isn't a platformer; rather, I'd call it a 'floater'. 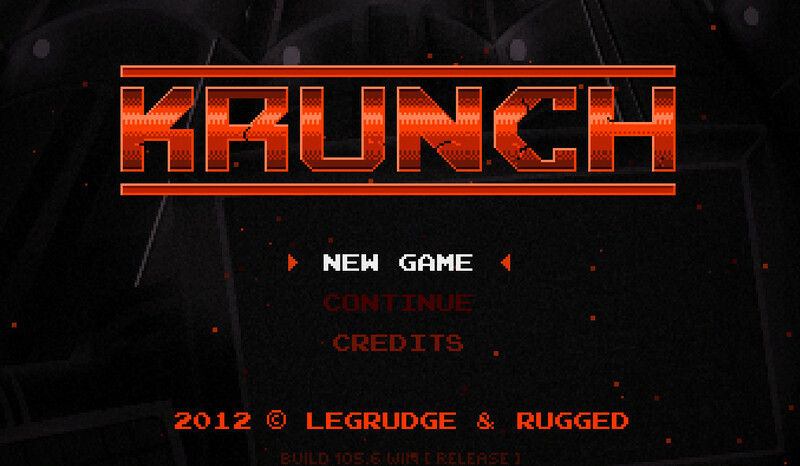 Birthed from a Ludum Dare prototype, KRUNCH has an awful lot to offer gamers who really enjoy punishing themselves. Gameplay strongly evokes Super Meat Boy. The comparison is inevitable and the inspiration is blatantly obvious, but this isn't a bad thing, nor is the game a clone or copy. Given that the player is floating and not running and jumping, it all feels familiar yet completely different, and uniquely challenging. There are over 100 levels to conquer spanned across four areas. 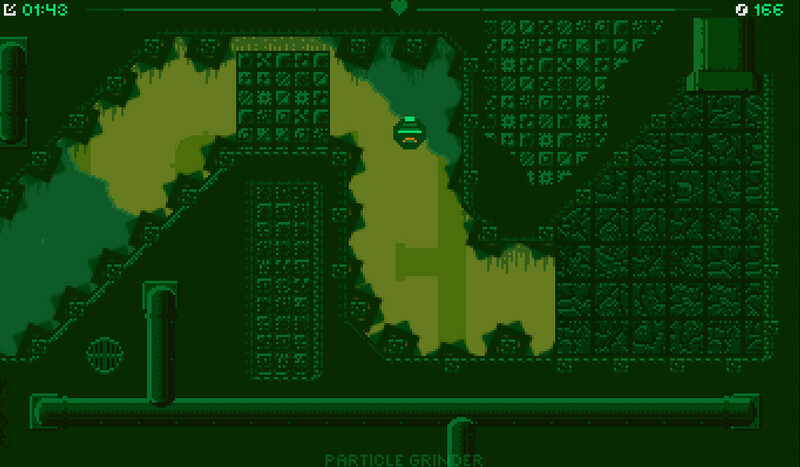 Each of these areas has a specific look and feel, bolstered by superb NES style visuals, minus sprite flicker, of course. The ambiance is gloomy and heavily soaked with doom, the palette awash with dark, monochromatic themes of crimson, purple, green, and blue; a constant reminder of imminent death, of which there is plenty. The chiptunes, done in part by the fabled Disasterpeace (who also worked on Phil Fish's FEZ), further reinforce this gloom and also lend an air of urgency to the game when it's needed. The sound FX, done by Jordan Fehr (who recently worked on the gem Hotline Miami) tie everything together quite well, especially the pulsating heartbeat alerting players that they are about to - surprise - die. All in all, KRUNCH is an excellent game for those who are really craving a challenge, and aren't shy of shouting expletives over and over again whilst racking up dozens of deaths trying to outrun that surly alien worm bent on destruction (and making a snack out of the player's 134th spent life). The art, music, and overall production value of this game are top notch, with a play experience to match. While there is a lot of content, skilled players may exhaust what is offered somewhat quickly – so I'd say replay value is low. However, the thrills and challenges this game provides along with simply beautiful art and music make this well worth the $9.99 entry price for fans of the genre. 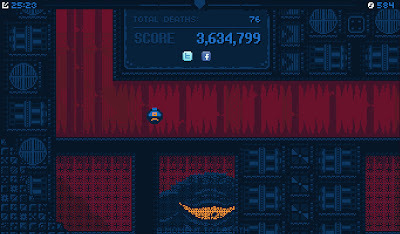 Buy the game here (from the KRUNCH website). I have to confess that although I wholeheartedly agree with Peter's review (KRUNCH really is an excellent game), I was a more than a little disappointed by the lack of proper full-screen options and joypad control. I fully understand that adding joypad support to Flash programmed games is far from trivial, but simply recommending users to use 'joy2key' seems a little unsupportive considering that KRUNCH is very much designed to appear to be a console title. And yes, I'm aware that this was also the case with Terry Cavanagh's VVVVVV (including the version on Steam), but at least that came with joy2key bundled with the executable together with a simple set-up. However, in contrast to this complaint I'd like to congratulate Lou LeGrudge and Dirk Rugged on creating a limited 'collectors' boxed version - I was probably one of first customers, pre-ordering soon after launch, and even now (months later) I'm still excited about the prospect of receiving my copy in the post. The previews on their website look amazing, and after checking today it seems that they've received the prints so it should only be a matter of weeks before I have a copy sitting proudly on my shelf. It is a shame that more games are not developed with open configuration in mind. It is good practice to program a game with a 'controller object' that acts as an interface between the player and game rather than hard-code movements and button presses - that way you can easily add in the ability to configure controls later down the line, allowing user-selectable inputs in one place in the code. Sadly many commercial PC games (indie/non-indie) are designed with consoles in mind first and foremost, so this is ignored - and to add user-definable controls later becomes extremely difficult.